The RC2110836 was tested at 350C to demonstrate endurance. The parts survived for more that 3,600 hours. The results extrapolate to one-year life operating at 300C and more than ten-year life at 225C. Electromigration of tungsten-aluminum process metal indicated lifetimes exceeding eight years at 300C. Full results, electromigration studies and life test, are found in our recent paper presented at HITEC 2018. The full paper can be found at http://imapsource.org/doi/abs/10.4071/2380-4491-2018-HiTEN-000112?code=imap-site. 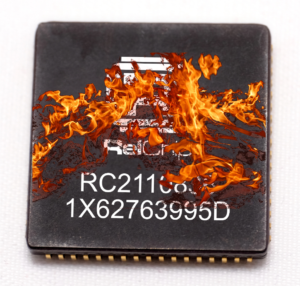 The RC2110836 Data Sheet can be found at https://www.relchip.com/wp-content/uploads/2018/03/RC2110836.pdf.